I was pleasantly surprised to hear that Mike Lassiter and Scott Galloway, both local residents, were having a screening of their film, "Our Vanishing Americana", at the local Public School in Davidson this past Sunday. Originally published as a book by Mr. Lassiter in 2006, this beautiful collection of photographs, and their accompanying stories, were, with the aid of Scott Galloway, made into a wonderful film documentary in 2009. I originally ran across this book at the Library in Mooresville and saw the film last winter on TV1, a local municipal station. The whole idea of making a film from the book sprang from the simple act of Mr. Lassiter's having met Mr. Galloway. Sharing the same passion for these old stores propelled them to collaborate on the film. So they set off to revisit several of the places shown in the original book. Utilizing the photographs of local "Mom and Pop" stores, Mr. Lassiter had drawn an impression of North Carolina that seems to disappear more quickly with each passing day. (Witness the old Fire Station on South Boulevard as a recent example.) It's what we do here, tear down the old buildings and landmarks, replacing them with corporate arenas that no one wants, or attends. Shopping malls, large and small, along with housing developments, dot the countryside where once there were beautiful, intimate towns and country stores. Some of these stores had been owned and operated for generations by the same families. There aren't that many left. I am lucky enough to live in an area of the state that is home to a few of the stores highlighted in the book, as well as the film. The personalities of the people in the original photos seem to spring to life on the screen. And Mr. Galloway does a superb job in making that happen. He captures on film, that quality of light, and even the ambience of the places he films. With the added combination of Mr. Lassiter's narrative, the whole experience takes on a life of it's own. The music that punctuates portions of the film is, for the most part, all homegrown. From "Country Roads" by native son James Taylor, to the rollicking sound of "Wagon Wheel" by Old Crow Medicine Show, the music is pure North Carolina, and speaks to the beauty of the area. One of the best, and most poignant portraits in the film is the segment that deals with Hinckle's Market in Lexington. The store is in it's third generation, and while the current owner and his brother have often contemplated closing it, whenever a customer comes in and tells him that the town couldn't live without him, they simply keep on. D.E. Turner's Hardware store, located about 15 minutes from my home, is featured in the film. I have purchased odds and ends there for over 10 years. I have bought as few as 4 screws there when necessary to complete a job. His Radio Flyer collection of toys is unequaled the area. The whole point of this effort by Mr. Lassiter and Mr. Galloway, is not simply to sell nostalgia, but more importantly, to ask what we can do to preserve these stores for our children and grandchildren. And while we all understand the necessity of shopping for the best price, maybe we can step back a bit and buy some things from our local Main Street stores. Only by keeping the stores economically viable can we hope to keep them going for yet another generation. And the most important thing of all is that with each of these "mom and pop" shops that gets lost - we lose a little bit more of ourselves. 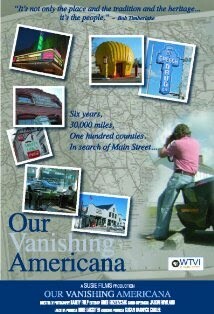 Here is the link to the site for "Our Vanishing Americana." Hurry up and take a look, it's going fast. And thanks to Mr. Lassiter and Mr. Galloway for a delightful treat on a Sunday afternoon.